Union Public Service Commission (UPSC) is going to conduct Combined Defense Service (CDS I) written exam for the 464 posts of various officers in Indian Military Academy, Indian Naval Academy and Air force Academy on 15th February 2015. A lot of numbers of candidates had applied for these posts. The Latest News is that UPSC has Released Admit Cards for UPSC CDS I Exam which will be available on official website of UPSC CDS I. Those candidates who had applied for UPSC CDS I Exam 2015 and waiting for admit cards can get their admit cards from the direct link provided in the end of post. · Read the instruction provided for the exam. · Choose the mode to download Admit card i.e. Using Application No. or Using Token No. provided in the application of the candidate. · Enter Application number or Token no. and Date of birth. · Click on Login button. The written exam will be conducted on 15th February 2015 in two sessions i.e. Moring & Evening Session. The Exam will be conducted on Pen Mode. In Pen Mode there will be OMR sheet which will be filled by Blue/Black ball point pen. There will be a multiple choice questions paper containing subjects English, Mathematics and General Knowledge questions. The total marks for exam will be 100 and duration will be 2hrs. 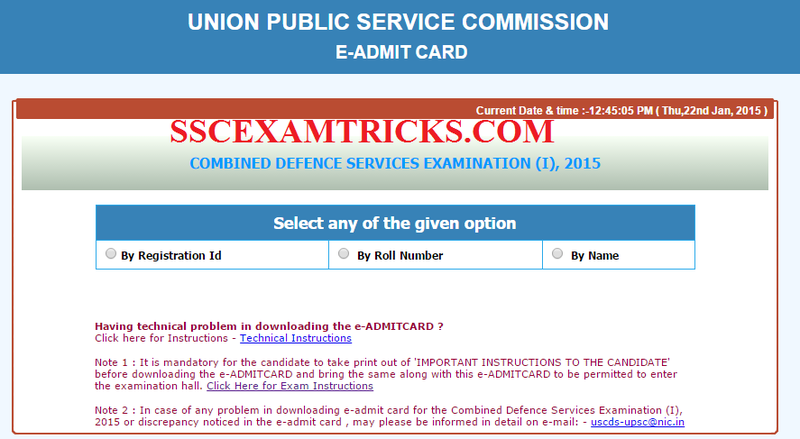 Click here to download the complete syllabus of UPSC CDS I Exam 2015.